About John C. Crick, M.D. John C. Crick, M.D., is a board-certified orthopedic surgeon with added certifications in hand surgery at Bahri Orthopedics and Sports Medicine Clinic in Jacksonville, Florida. His comprehensive education and background make him an expert specialist in hand and wrist surgery. Dr. Crick attended medical school at the University of Michigan and then continued with an internship at the University of Southern California, in Los Angeles, California. He then went on to practice emergency medicine as a member of the American College of Emergency Physicians. Dr. Crick found his special interest in trauma and continued to complete an orthopedic residency and fellowship in hand and microvascular surgery at Shands Jacksonville Medical Center in Jacksonville, Florida. He’s a fellow of the American Academy of Orthopaedic Surgeons, and a member of the American Society for Surgery of the Hand where he continues to serve on the self-assessment examination committee. He has been recognized as a top surgeon by Castle Connelly for over 10 years. 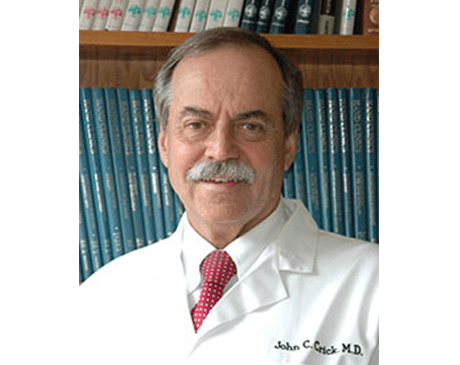 Dr. Crick has published over a dozen scientific articles on nerve and artery injuries, children’s hand fractures, athletic injuries of the hand, wrist fractures, tissue plasminogen activator, and the legal aspects of reflex sympathetic dystrophy. Dr. Crick is a recipient of the Beal’s Award for outstanding scientific paper by the Duval County Medical Society. In addition to his many research contributions, he continues to dedicate time to teaching, having served as a faculty member for orthopedic training in Lima, Peru. He helps patients with carpal tunnel syndrome, thumb or hand arthritis, hand and wrist injuries, hand fractures, Dupuytren’s disease, trigger finger, DeQuervain’s tendonitis, wrist arthroscopy, tendon injury, ligament injury, and gamekeeper’s thumb. Call the clinic or schedule an appointment online today to learn how Dr. Crick can help you with your hand and wrist needs.